My name is Ahmad Abdel-wahed. Pleased to "meet" you. I am a computer user, and I do this stuff for a living. I am trying to structure something interesting and informative that you would want to come back and see again after you've seen it this time. Come back often, as there are likely to be new links here all the time. The information about me is going to be very static, but if you know me, you will know that I am anything but static. I think you will learn the most about me through the links I show you, so please look through the list, and follow a few of them. There's not quite something for everybody, but there is interesting stuff. Enough about that. As you can tell from my money here, I like to laugh at myself a great deal. If I ever were to appear on a financial note, I doubt it would be a billion dollar bill! Don't you? Okay, so by now you have figured out that I am not about to tell you very much about myself. The truth is that there is not all that much to tell. I live. I love. I eat. I sleep (weeeeeeeell, maybe not). I enjoy my cats. I play my guitar, I write, I use computers, I write some software, I use more software than I write, but hey, them's the breaks. I spend most of life doing e-mail actually. I have too many e-mail accounts to list here, but I try to get to all of them on a regular basis. Do you want to find out what the boss thinks about what's happening to the company lately? Think I may be online? I am sometimes here chatting in KindredSpirits on the MSN server. If you do go there, bring a poem you would like to share with the room. It is a great place to go when you need a little pick-me-up. This place holds many fond memories for me and I have formed very fulfilling relationships as a result of it. I will always be a member of that community, regardless of its name or constituency. Since I am not really much of a sports fan, it is exceptional for me to root for teams. Last year, however, football took me by storm again, and Niners, Raiders, Jets, and Giants logos appeared on my shirts, hats, and jackets. I check out what is happening in the league here. I was really disappointed that none of my favorite teams got too far this year, but at least now you know who I am going to be rooting for next year. That is, of course, unless I choose to root for the local team. Jessi is great gal. She can't remember how she met me, but it was in MSN chat. She used to make her own room, and her friends would go there. One of them invited me in, and that was that. Of course it was a long time ago (must have been about two years ago, and now we just chat in ICQ. Check out her page, and look at the drumline website. It's good stuff, and reminds me of when I was in marching band in high school. Check out my friend Skippy. If you follow this link, please be sure to come back here and drop me a note telling me what you thought. I always have fun at her site, and I bet you will, too!! Have fun at Lisa's site. She is in the middle of teaching herself HTML (with a teeny tiny bit of help from me), and I think she's doing great!! What do you think? Look for neat things to happen here, starting in the next few days! Check out my pal Dianna from New Jersey. We've worked together, and she more than knows her stuff!! Dianna, if you ever look here, we never did have those drinks before I left, huh? 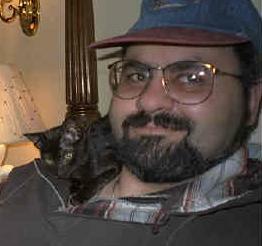 Check out my chat friend HugMonster from County Antrim, Ireland, and his web presence. Please be sure to say hello from me when you get there! Listen to my chat buddy Lytti getting his head hit by a fry pan on his page, and be sure to go pet the kitty on the next page! Good thing Bev doesn't really use the frypan on him like that any more. Check out the legal perspective from Mark's page. While you're surfing my friends' web sites, don't forget to stop in on The Yank & The Brit (SouthBeach/Cove neighbors of mine! just a few doors down the lane), and wish them well on their good fortune to have met and gotten married! I've known Gazza and Donutt as long as I have been chatting! They don't have their own web site yet, but my cats are going to visible here soon. The picture at left shows me with my artificial beard extension the week that she came to live with us. She was around 4 months old in this picture, and she looked like a part of my beard! Aramis (who turned 4 years old on 4/4, and we call him Baby) is developing an ActiveX control that I will be using on this page soon. Victoria Lynn (also known as Monster, pictured with me at left) is a little over 1 year old, and she has been helping me with this by sitting on the keyboard as I try to type. Shalimar (to whom we refer as Tina), has a lock on graphic design in her nearly 12 years, and keeps telling me to "scratch" this site and start over. Hmmmm! I will have to run this by Lauren and Bill (who are now both my neighbors again, yeah!!!!) and see what they think of Shashlick's opinion. Want me to list your site here? I will do it gladly, usually within minutes of you informing me that you want me to do so. Let me know! Check out my Mom's cousin's work at the Abney Gallery. If you like the piece at left, then you like my cousin's work. "AMAZING!" If you would like to know more about how I made the background to this page, please just email me. For now you can see the full size image in its real colors that I used for the background here (368 kb). If you would like to know more about how I find images like this one (called a mini-mand), click here for my step by step narrative on finding a mini mand (a snow-mand, actually). The world's most accomplished rock band. There is nothing more to be said. Lately I have been listening to lots of Living Colour again, but have not been able to find any really cool web sites about them other than these. If you have one or know where there is one, please let me know! I was going to list Vernon Reid separately since it always seemed to me he was the driving force behind that band, but his solo work is just *not the same* as what he created with Corey and the boys. Phish rocks! Check them out here, and get release dates, tour schedules, info about the band - name it! Thanks Kristen for the link!!!!!!! As a musician, I am not sure how I ever survived without Cakewalk. If you are a musician, try it too, and you will be hooked! There is a free demo version you can try before you buy. Thanks to Dave O. at MMA for giving me this pointer. Hey Dave, when are we gonna jam? If you're like me and you like listening to your favorite music on your computer, you need a tool to let you make wav files from your favorite CD's. This utility lets you do exactly that, but it's biggest drawback is that I can only find a 16-bit version. Please note I do not support this tool in anyway other than telling you about it. I am looking for a 32-bit replacement for this tool, so let me know if you know of one. There once was a song called "Lost Without You" (this is 135k of it), and thanks to Lisa, I got obsessed with trying to identify its singer and writer/composer. It sounds like so many other songs I have heard, but it wasn't that easy to determine who its creator was. So the obsession went on and on, and the closest reliable hit was Joan Armatrading (NOT!!!). The runner up was a song called Lost Without Your Love by Bread (also NOT!!!). Then Jerri came up with this one day out of the clear blue sky. The mystery is over. Handheld PC's are big now. This one looked like the winner for some time and I know many satisfied users, but the new machines with color capability are here, so all bets are off. This is the one that I use, and it has truly CHANGED MY LIFE. Check out the neato computers you can buy on line. That's how I got mine, and I am glad I did. Thanks to Andrew Barkoff from Dell for letting me know what the company was doing and how I could take advantage of it. The notebook I got over a year and a half ago is still going strong, and now I will be getting a desktop machine from them that is 4 times as powerful as my notebook!!! WOW! My newest hobby, generating fractals is a very software dependent one. Fractint is the premiere palette-based fractal generator for PC platforms. CHECK IT OUT!! I used it to make this background as well as other images. If you are interested insomething that gives you less control but runs in Windows, and generates 24-bit true color images, I heartily recommend Iterations 28 and Tierazon 2.6. I think my images are cool but the author of these two programs has some amazing stuff up there. If you can't already tell, I enjoy Mirabilis' ICQ because it lets me keep in touch with friends and family while on line. It's worth checking it out. They have done amazing things in a very short period of time. This was fairly new when I started using it about a year ago and they now have several million users!! WOW! Need some Windows 95 software? Go here for all the shareware and freeware you could ever want or need. Are you interested in Windows 95 Themes? I am! Go here for a set of sites with some good (and some bad) themes. Looking for drivers for your computer? Here, you will find everything imaginable as far as software support for different devices goes!! Thanks for the link, Harry!!!! If for some reason, you can not tolerate ICQ, I also use iChat Pager to stay in touch with friends. From what I can tell, ICQ is far superior. Want to find out what company's internet server is powering your favorite website? Go here and type the URL about which you are curious. The results may surprise you! If you are an MSN user, and like having fun with chat, check out Serious Chat from Muse Software and WebMistress. This is heavyweight software for lightweight use! Speaking of gratuitous plugs, this site certainly does not need my recommendation, but jeez, I spent so much of my time there I figured I owed them some kind of rent. My newest obsession is higher than analog bandwidth consumer connections. There are several new offerings from the phone systems to the TV programming-like offerings. Cable modems are the highest speed option I have found yet (look in this find link frequently if you are interested since new information is available daily). In my area, you can look here to see what is available from Optimum Cablevision along these lines. You should look for Comcast and Time Warner offerings as well, as these companies are all leading the charge to bring bandwidth hundreds of times faster than ISDN to each home. Here is some info about the slowest of the TV-oriented offerings. DirecDuo is a Hughes Network Systems product that allows your dish to let your TV and your puter party with fidelity and speed. The only thing you have to watch for is that performance can suffer during thick overcast and cloudy weather. Sometimes you can just forget about it in the rain or snow. Also this is not nearly as fast as cable modems. Another interesting product I learned about in Phoenix (thanks for the link, Nick!) is public DSL. This is a local offering in Phoenix from US West, but I expect as demand for bandwidth increases, this will be offered on a more widespread basis. Anything by Douglas R. Hofstadter. Really. You simply can't go wrong. For example, Gödel, Escher, Bach is an amazing book that opened my mind to things I would NEVER have thought about without his insight. Take for example this little ditty that demonstrates the inherent semantic ambiguity of language. Anything by Kahlil Gibran. Love Letters is particularly moving, and I bought my copy at Barnes & Noble. It's really easy to find it there. For those interested in fractals, and what they do, James Gleick's "Chaos" is a total must read. I am still looking for a link that describes it, but I KNOW Barnes and Noble have it. Have you ever been to a haunted house? 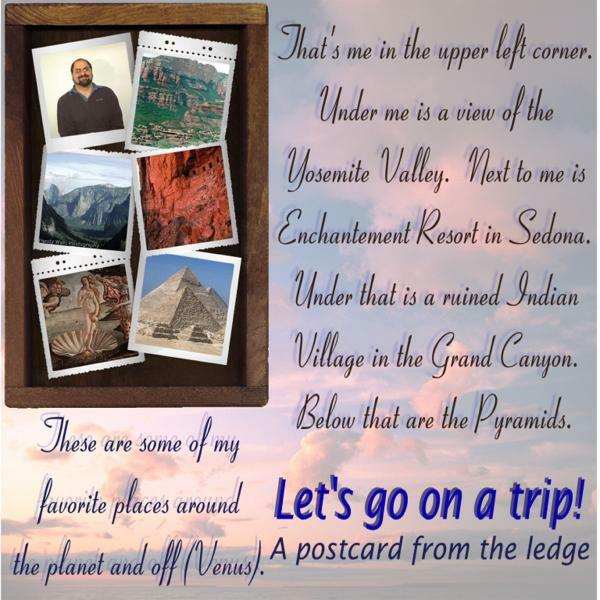 Click here if you are thinking about this stuff and you will see a list of sites that will lead you into otherworldly adventures. Ever wonder how much Bill Gates has accumulated right now in terms of raw wealth? Go here to see what one person thinks. As you might guess, this number changes with the stock price. Wanna get to know yourself a little better? Maybe gain a little insight into why you do the things you do? Go here and you will see a whole list of self-assessment tests you can take and learn all about yourself. The Lipstick personality test was interesting. The one (temperament sorter) I like the most is based on the Myers-Briggs personality inventory and is quite accurate. Be prepared to spend some time if you take the temperament sorter, but you will learn something about yourself. Thanks Dianna for this set of pointers! There are a couple of totally amazing astrology sites on the net for free. Mystic Stars is really cool and was shown to me by Babs. Thanks, Babsy!!!!!! Pathfinder's Astrology Zone was also shown to me by Babsy and has eerily accurate horoscopes. If you click nothing on this page, go to the Pathfinder site. There's another site I went to and got a chart for eleven dollars, but it is over 100 pages, and I have not been able to read it yet. I will update this paragraph when I see if the chart is right about me or not. Another way to learn about yourself is to see what the stars have in store for you. Don't use those Western Astrology techniques, though, try your Chinese horoscope. Thanks again go to Dianna for this link. On the topic of astrology, there is everything *but* astrology at this site. If you have ever read Illusions by Richard Bach, you will recognize the concept of strichomancy and appreciate this brilliant implementation of that practice. Thanks go to Siouxzen for this link from months and months ago! And speaking of God's country... If you ever go to the Arizona/Nevada area, you MUST go here. For a list of sites about the place, click this and you will get lots of info! 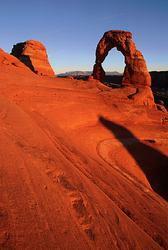 This is delicate arch in Arches National Park. I have actually seen it from a different vantage, but it is still just as incredible from wherever you are when you look upon it. The colors in this picture are slightly exaggerated because it was taken near sundown. In reality, the colors are a little more like what you will see at the site, that is, more sandy. The red rock look in this photo is more like what you would find in Sedona. I have an affinity for the southwest, and Mesa Verde was actually the first place I ever experienced it. These ruins amidst the red rocks at the feet of the mesa are haunting, and not just because of the circumstances under which their inhabitants abandoned them. If you're looking for cars, checkout Carpoint where you can do everything short of actually feel how the car handles the road. An alternative to that is auto-by-tel, where they can get you the lowest price possible for any car with whose manufacturer they have a relationship. If you are traveling, you must look at Expedia for flight, rail, hotel and car rental reservations and purchases. I can not say about the ease of use and the quantity of detailed information available through this service. If you are interested only in buying airline tickets, Flifo seems to have incredibly good fares, as long as you play within the restrictions. Of course the absolute best way to get books is to use Barnes & Noble. I can not tell you enough how much better this is than any alternative I have yet encountered. Not only are the prices lower, and delivery faster, but you save the trip to the store, you can shop in the middle of the night, and my friend Albert Kim architected and managed the creation of the site!! Woooohoooo! For books nothing beats Barnes & Noble, and for music, nothing beats CD Now. Save yourself a couple clicks and go down to the CD Now search at the bottom of this page and look for something you want. I have yet to think os something they do not have, AND, they make recommendations based on what you like. That is technology doing something valuable for a change. If you're looking for general merchandise and do not feel like going to a department store, look at iQVC for some good deals. Beware the closeouts and discontinued models, though. Looking for information about a stock that trades on NASDAQ? This is my favorite place to sit. They will tell you or point you to almost everything you need to know about a company to determine whether or not to invest, if the company trades over the counter. Why do people have web pages? Is it a way to let people get to know them? Do you know me better now that I have told you about what interests me? There is not much content that is meaningful on the web. How is my page? Are the links broken? Are they worth fixing if they are? I would like to know. Enough summary for now. If you think you know the answers to these questions and more, please -- you must let me know too!! This page will grow more meaningful if I have your advice on what is good about it, and what could use improvement. Here is where you can tell me either who you are, what you think of this stuff, or both. please let me know in the area below. Thanks to Jessi for the info about doing this. I think it rocks! This is my first attempt at it, and here is my playlist. Listen to my heavy metal radio station, or read my preferences. Please let me know what you think of my playlist. Listen to my country music radio station, or read my preferences. Please let me know what you think of my playlist. Listen to my classic rock (with a plus) radio station, or read my preferences. Please let me know what you think of my playlist. Listen to my jazz radio station, or read my preferences. Please let me know what you think of my playlist. Listen to my eclectic collection of artists radio station, or read my preferences. Please let me know what you think of my playlist. This is a great place to get music. You will find movies and stuff.